The victories and frustrations Inserra recounts are timeless—nothing is more eternal than the battle between good and evil. 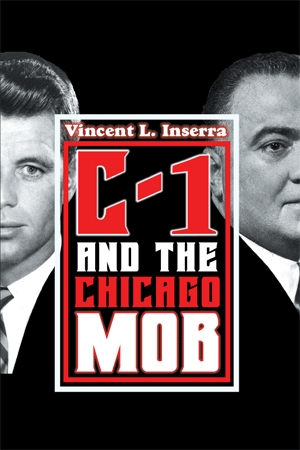 C-1 and the Chicago Mob by Vincent L. Inserra gives an insider’s look at two very intriguing institutions: the FBI and organized crime. Inserra tells the story of the law enforcement agents who battled the Chicago mob between the late 1950s and early 1970s: the Chicago FBI’s Criminal Squad #1 (C-1). Inserra spent nearly two decades tracking, prosecuting, and convicting mobsters as part of the C-1 squard, including thirteen years in charge of it. The book extols the virtues of the C-1 without falling into hero worship. Drawn from Inserra’s life and research, the book is quite detailed—delivering entertaining moments of suspense and action, but deepening them with an FBI agent’s eye for information and connections at every step of the process. His view is both big-picture (he sees how each event fits into the era) and in the trenches (he knows the name, personality, and rap sheet of every mobster in the city). The book harkens back to another time, far from the cynicism and brutality that mark the modern law enforcement landscape; and yet the victories and frustrations Inserra recounts are timeless—nothing is more eternal than the battle between good and evil. Organized crime captures fear and imagination, making this an enticing book for those who love crime and law enforcement–themed dramas. The book is packed with movie-worthy anecdotes: nailing a well-known violent criminal for failing to file his federal taxes—even more interesting since the convicted man’s name, Vincent Inserro, is only one letter off from the author’s. Inserra also illuminates the underbelly of the police force: the C-1 prosecuted a group, headed by a Chicago officer, that posed as police officers to extort money from “military officers, college professors, Hollywood celebrities, politicians,” and others whose livelihoods depended on no one finding out that they were homosexuals. The author shares his inside knowledge in a way that those outside law enforcement can understand; in fact, his word choice is quite pedestrian at times—the book opens with a description of a raid on a group of “prominent hoodlums” from across the country. Interior photographs, though sometimes dark and grainy, add flavor and insight to the book: from a photo of mobsters out to dinner together to a Christmas card from the Robert Kennedy family to gossip-worthy photos of the ladies of high crime. The short chapters divide the book into bite-sized, single-incident chunks, making it easy to pick up for a few minutes or for a whole afternoon. The pace is methodical but focused on forward motion: occasionally it’s slowed by the long, clause-heavy sentences and lengthy paragraphs. Get the facts behind crime fiction from C-1 and the Chicago Mob.